I can hardly believe it myself but I have never used a downloadable pattern before. So I decided it was high time I tackled that new experience.I love all of the coats in the shops at the moment with contrast sleeve so that is what I am planning on making. I was recently given some amazing faux leather, it is wonderfully soft and looks so real (nobody will ever know)Perfect for the sleeves. For the body I am using the Aine wool from my website. 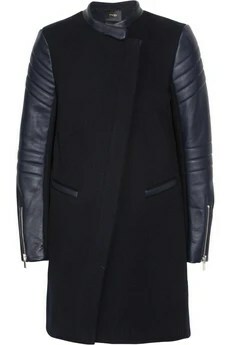 I think Mr Fabric Godmother will be impressed, all of my other winter coats have 3/4 length sleeves, not very practical. 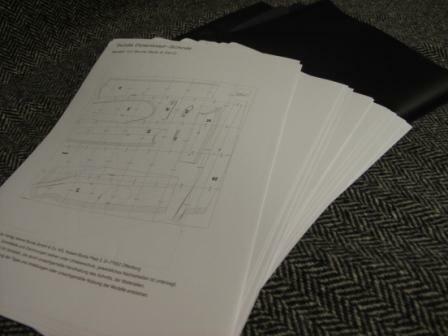 First thing I noticed was how many A4 sheets I had to print off (44 to be exact) phew that is a lot of black ink, just as well I have a spare cartridge! I found it easiest to tape up the paper pattern in stages, unless you have a massive house with a huge lounge floor I suggest you do the same. Be warned you will need a LOT of tape. Once the whole thing was taped together I cut the pattern pieces out, not forgetting to add seam allowances as they are not included in the pattern. I then spent some time playing with the layout. As I am making the sleeves from a different cloth I was hoping not to need as much of the wool fabric. But the fabric I am using is a little narrower than the recommendatory 150cm wide fabric so I needed 2.30m. Still I got here in the end. I think that is enough download excitement for this sewer this evening so I’m off to bed. Tomorrow I will be cutting the fabric – always the scary bit!